Sir Ahmed Salman Rushdie (born 19 June 1947) is a British Indian novelist and essayist. He achieved notability with his second novel, Midnight’s Children (1981), which won the Booker Prize in 1981. Much of his early fiction is set on the Indian subcontinent. His style is often classified as magical realism mixed with historical fiction, and a dominant theme of his work is the story of the many connections, disruptions and migrations between the Eastern and Western world. His fourth novel, The Satanic Verses (1988), was the center of The Satanic Verses controversy, with protests from Muslims in several countries. Some of the protests were violent, with Rushdie facing death threats and a fatwā issued by Ayatollah Ruhollah Khomeini, the Supreme Leader of Iran, in February 1989. He was appointed a Knight Bachelor for “services to literature” in June 2007. He holds the rank Commandeur in the Ordre des Arts et des Lettres of France. He began a five-year term as Distinguished Writer in Residence at Emory University in 2007. In May 2008 he was elected to the American Academy of Arts and Letters. His latest novel is The Enchantress of Florence, published in June 2008. His first novel, Grimus, a part-science fiction tale, was generally ignored by the public and literary critics. His next novel, Midnight’s Children, catapulted him to literary notability. It significantly shaped the course that Indian writing in English would follow over the next decade, and is regarded by many as one of the great books of the last 100 years. This work won the 1981 Booker Prize and, in 1993 and 2008, was awarded the Best of the Bookers as the best novel to have received the prize during its first 25 and 40 years. Midnight’s Children follows the life of a child, born at the stroke of midnight as India gained its independence, who is endowed with special powers and a connection to other children born at the dawn of a new and tumultuous age in the history of the Indian sub-continent and the birth of the modern nation of India. The character of Saleem Sinai has been compared to Rushdie. After Midnight’s Children, Rushdie wrote Shame (1983), in which he depicts the political turmoil in Pakistan, basing his characters on Zulfikar Ali Bhutto and General Muhammad Zia-ul-Haq. Shame won France’s Prix du Meilleur Livre Étranger (Best Foreign Book) and was a close runner-up for the Booker Prize. Both these works of postcolonial literature are characterised by a style of magic realism and the immigrant outlook of which Rushdie is very conscious, as a member of the Indian diaspora. Rushdie wrote a non-fiction book about Nicaragua in the 1980s, The Jaguar Smile (1987). The book has a political focus and is based on his first hand experiences and research at the scene of Sandinista political experiments. His most controversial work, The Satanic Verses, was published in 1988 (see section below). Rushdie has published many short stories, including those collected in East, West (1994). The Moor’s Last Sigh, a family epic ranging over some 100 years of India’s history was published in 1995. The Ground Beneath Her Feet (1999) presents an alternative history of modern rock music. The song of the same name by U2 is one of many song lyrics included in the book, hence Rushdie is credited as the lyricist. Rushdie has had a string of commercially successful and critically acclaimed novels. His 2005 novel Shalimar the Clown received, in India, the prestigious Crossword Fiction Award, and was, in Britain, a finalist for the Whitbread Book Awards. It was shortlisted for the 2007 International IMPAC Dublin Literary Award. In his 2002 nonfiction collection Step Across This Line, he professes his admiration for the Italian writer Italo Calvino and the American writer Thomas Pynchon, among others. His early influences included James Joyce, Günter Grass, Jorge Luis Borges, Mikhail Bulgakov, and Lewis Carroll. Rushdie was a personal friend of Angela Carter and praised her highly in the foreword for her collection Burning your Boats. He opposes the British government’s introduction of the Racial and Religious Hatred Act, something he writes about in his contribution to Free Expression Is No Offence, a collection of essays by several writers, published by Penguin in November 2005. Rushdie is a self-described atheist, and a distinguished supporter of the British Humanist Association. In 2006, Rushdie joined the Emory University faculty as Distinguished Writer in Residence for one month a year for the next five years. Though he enjoys writing, Salman Rushdie says that he would have become an actor if his writing career had not been successful. Even from early childhood, he dreamed of appearing in Hollywood movies (which he would later realize in his frequent cameo appearances). Rushdie includes fictional television and movie characters in some of his writings. He had a cameo appearance in the film Bridget Jones’s Diary based on the book of the same name, which is itself full of literary in-jokes. On 12 May 2006, Rushdie was a guest host on The Charlie Rose Show, where he interviewed Indo-Canadian filmmaker Deepa Mehta, whose 2005 film, Water, faced violent protests. He appears in the role of Helen Hunt’s obstetrician-gynecologist in the film adaptation (Hunt’s directorial debut) of Elinor Lipman’s novel Then She Found Me. In September 2008, and again in March 2009, he appeared as a panelist on the HBO program “Real Time With Bill Maher”. The publication of The Satanic Verses in September 1988 caused immediate controversy in the Islamic world because of what was perceived as an irreverent depiction of the prophet Muhammad. The title refers to a disputed Muslim tradition that is related in the book. According to this tradition, Muhammad (Mahound in the book) added verses (sura) to the Qur’an accepting three goddesses who used to be worshipped in Mecca as divine beings. According to the legend, Muhammad later revoked the verses, saying the devil tempted him to utter these lines to appease the Meccans (hence the “Satanic” verses). However, the narrator reveals to the reader that these disputed verses were actually from the mouth of the Archangel Gibreel. The book was banned in many countries with large Muslim communities. On 14 February 1989, a fatwā requiring Rushdie’s execution was proclaimed on Radio Tehran by Ayatollah Ruhollah Khomeini, the spiritual leader of Iran at the time, calling the book “blasphemous against Islam” (chapter IV of the book depicts the character of an Imam in exile who returns to incite revolt from the people of his country with no regard for their safety). A bounty was offered for Rushdie’s death, and he was thus forced to live under police protection for years afterward. On 7 March 1989, the United Kingdom and Iran broke diplomatic relations over the Rushdie controversy. The publication of the book and the fatwā sparked violence around the world, with bookstores being firebombed. Muslim communities in several nations in the West held public rallies in which copies of the book were burned. Several people associated with translating or publishing the book were attacked, seriously injured, and even killed. Many more people died in riots in Third World countries. Hardliners in Iran have continued to reaffirm the death sentence. In early 2005, Khomeini’s fatwā was reaffirmed by Iran’s spiritual leader, Ayatollah Ali Khamenei, in a message to Muslim pilgrims making the annual pilgrimage to Mecca. Additionally, the Revolutionary Guards have declared that the death sentence on him is still valid. Iran has rejected requests to withdraw the fatwā on the basis that only the person who issued it may withdraw it, and the person who issued it – Ayatollah Khomeini – has been dead since 1989. Rushdie has reported that he still receives a “sort of Valentine’s card” from Iran each year on 14 February letting him know the country has not forgotten the vow to kill him. He said, “It’s reached the point where it’s a piece of rhetoric rather than a real threat.” Despite the threats on Rushdie, he has publicly said that his family has never been threatened and that his mother (who lived in Pakistan during the later years of her life) even received outpourings of support. A former bodyguard to Rushdie, Ron Evans, planned to publish a book recounting the behaviour of the author during the time he was in hiding. Evans claimed that Rushdie tried to profit financially from the fatwa and was suicidal, but Rushdie dismissed the book as a “bunch of lies” and took legal action against Ron Evans, his co-author and their publisher. On 26 August 2008 Rushdie received an apology at the High Court in London from all three parties. Rushdie came from a Shi’ite Muslim family but says that he was never really religious. In 1990, in the “hope that it would reduce the threat of Muslims acting on the fatwa to kill him,” he issued a statement in which he claimed “he had renewed his Muslim faith, had repudiated the attacks on Islam in his novel and was committed to working for better understanding of the religion across the world.” But later said that he was only “pretending”. Rushdie supported the 1999 NATO bombing of the Federal Republic of Yugoslavia, leading the leftist Tariq Ali to label Rushdie and other “warrior writers” as “the belligerati'”. He was supportive of the US-led campaign to remove the Taliban in Afghanistan which began in 2001, but was a vocal critic of the 2003 war in Iraq. He has stated that while there was a “case to be made for the removal of Saddam Hussein”, US unilateral military intervention was unjustifiable. In the wake of the ‘Danish Cartoons Affair’ in March 2006 – which many considered to be an echo of the death threats and fatwā which had followed the publication of The Satanic Verses in 1989 – Rushdie signed the manifesto ‘Together Facing the New Totalitarianism’, a statement warning of the dangers of religious extremism. The Manifesto was published in the left-leaning French weekly Charlie Hebdo in March 2006. Rushdie continues to come under fire from much of the British academic establishment for his political views. The Marxist critic Terry Eagleton, a former admirer of Rushdie’s work, attacked him for his positions, saying he “cheered on the Pentagon’s criminal ventures in Iraq and Afghanistan”. 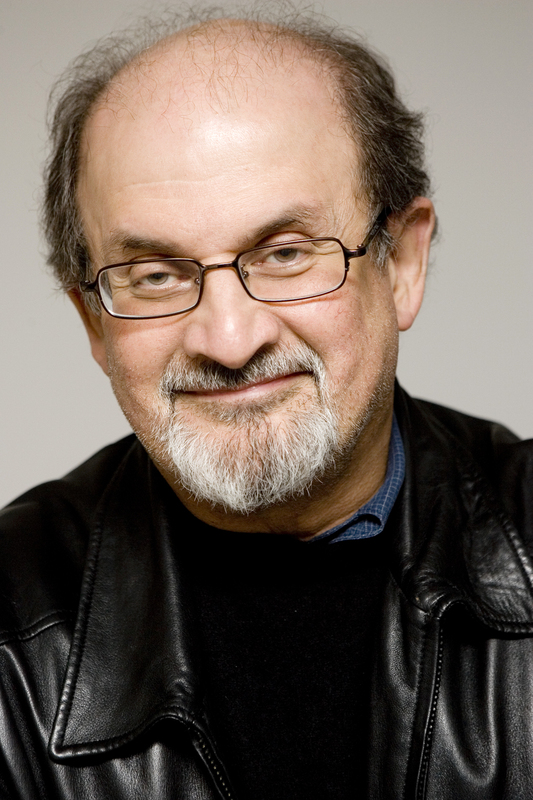 However, he subsequently apologized for having misrepresented Rushdie’s views. At an appearance at 92nd Street Y, Rushdie expressed his view on copyright when answering a question whether he had considered copyright law a barrier (or impediment) to free speech. This entry was posted on November 27, 2009 at 1:38 am	and is filed under Controversy, Literature, Men, Profiles. Tagged: Authors, Controversy, Literature, Men, Profiles. You can follow any responses to this entry through the RSS 2.0 feed. You can leave a response, or trackback from your own site.